Overview: It’s 1969 and two, rarely sober, out of work actors take a holiday from their squalid Camden Town flat to a no less dilapidated cottage in Penrith, courtesy of eccentric Uncle Monty. 1987; Handmade Films; Rated 15; 107 minutes. Joining the cult: A smoke infused living room, dingy wallpaper, a sink overflowing with ‘matter’ and eggs deep frying in an inch of fat. Marwood (Paul McGann), the ‘I’ of the film’s title, looks up from a salacious newspaper, his face pale and eyes red with devastation from the night before. With this disgusting mise-en-scene, there’s little wonder that Withnail And I’s most recent fans arrive at the film as students. Factor in the themed drinking games and Withnail And I is a surefire hit amongst viewers between the ages of 18 to 25. But Withnail And I is much more than a farcical comedy about a couple of drunks. Shooting his movie in confined interiors with low lighting, Bruce Robinson constructed a directorial debut infused with an atmosphere of reality. Robinson knew this world well and bases his characters on real lives. As a result, Withnail And I has as much to say about struggling artists in 1960s London as Inside Llewyn Davis does about 1960s New York. The complexity of human friendship: In the film’s early moments, alarmed by the state of the world, Marwood rushes home to discuss Withnail’s “problems in depth.” Marwood is naive, cerebral, philosophical, neurotic and paranoid. Withnail (Richard E. Grant) is entirely different. On Marwood’s arrival back at their dingy flat, Withnail is oblivious and talks over Marwood in his own self-absorbed tirade. Withnail is the type of man who uses up all the embrocation to keep himself warm in the freezing flat, selfishly declaring “there’s nothing left for you.” He’s narcissistic, a coward, and thinks the world owes him a living. He refuses to understudy, is impractical, “incapable of indulging in anything but pleasure” and possesses vast amounts of self-confidence. He even encourages Monty’s infatuation with the heterosexual Marwood just to get a free holiday. He’s also extremely charming. 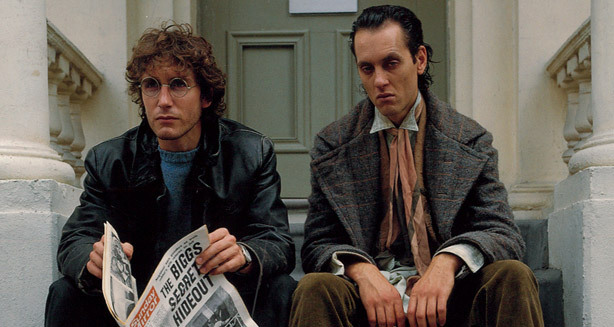 With this in mind, we might ask why Marwood and Withnail are even friends at all, but we rarely do. Their bond defies simple definition, emerging on-screen in large part from the chemistry between McGann and Grant. But how much strain can one friendship take? While their shared situation pushes them together, their differing work ethic eventually breaks them apart. Robinson doesn’t give us singular emotions, they’re all knotted, intertwined, hard to distinguish. Is Withnail jealous of Marwood’s apparent success? Or is he grieving the loss of his friend? When the real cracks in their friendship are finally revealed the sadness is inescapable. Love and misfortune: In contrast to Withnail and Marwood’s rough way of living, Uncle Monty (Richard Griffiths) epitomizes romanticism. When he arrives at the dilapidated Penrith cottage he brings with him a sudden sense of refinement. Candelabras are lit, meals are cooked and fine wine devoured. The mise-en-scene changes. Yet his culture and romanticism cuts through the squalor with a different kind of despair. Monty’s life is equally unfulfilled. He has a fake identity in the north – an elaborate french name – and is known to visit with his “son.” His every appearance is imbued with unrequited love and lost youth. And, despite Marwood’s terror in the attempted burglary scene, Monty’s disappointment following such a confident display of seduction sees him exit the film as someone to be pitied. The greatest deca de: With its Hendrix-heavy 60s soundtrack and political subtext, Withnail And I can even be watched as a state of the nation piece. In the background we read the smutty tabloids and witness demolition – destruction which foreshadows the friendship. Then there’s Monty’s struggle with closeted homosexuality and his political commentary that points to the end of an era, “shat on by Tories, shovelled up by Labour.” But it’s drug dealer Danny whose political leanings have most impact. When he tells us “London is a country coming down from it’s trip… they’re selling hippy wigs in Woolworths man, the greatest decade in history is over,” the complexity of the 60s is placed side-by-side with its cliches. In the very next scene, one character succeeds while another is left to fail – it’s a bittersweet metaphor for Britain’s emergence from the 60s. The Ending: At the film’s close, Withnail leans over the railings of the Regent’s Park wolf enclosure gripping a bottle of red. It’s pouring with rain. He recites a soliloquy from Hamlet. The meaning of this has been much discussed but you don’t need to be conversant with Shakespeare to grasp the speech’s pathos. Withnail is alone, his dreams are not fulfilled and it’s unlikely they ever will be. Possessing some quantity of talent but lacking conviction or drive and, crucially, without Marwood, Withnail is simply just a drunk in a park.